Dylan Pontiff — who helped organize a story hour for kids as young as age 3 at a Louisiana public library originally scheduled in October — is shown in a video telling the Lafayette City-Parish Council at a Sept. 17 meeting what’s behind the “very beautiful” event. “This is gonna be the grooming of the next generation,” Pontiff said. “We are trying to groom the next generation” to be accepting of LGBT values. Pontiff was dressed in street clothes for the meeting but goes by Santana Pilar Andrews when he’s onstage, LifeSite reported. What else did Pontiff say? Pontiff, who said he’s been bullied most of his life for being gay, blasted those opposed to the drag queen story hour — even those gathered at the council meeting. Pontiff denied charges that drag queen story hours are overly sexual and said he can alter content to make it appropriate for children. What’s been happening with the Lafayette drag queen story hour? The Lafayette event — originally scheduled in October at the library’s main branch downtown — has been postponed, with no new date announced, according to the Daily Advertiser. The paper added that the event was moved to a larger space at South Louisiana Community College, but the school backed out two days beforehand over security and logistical concerns. But Baton Rouge Pride announced a Drag Queen Story Time set for 2 p.m. Dec. 2 at the Aveda Institute Baton Rouge, the Daily Advertiser reported. What do others have to say about the issue? 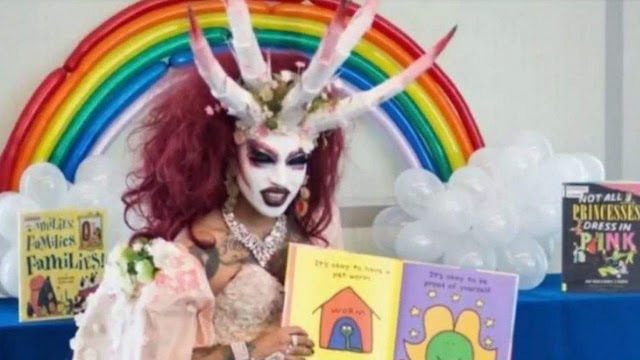 “Unfortunately, the Drag Queen Story Hour program is turning public libraries into platforms to advance the transgender revolution, places where pro-homosexual activists are given access to children as young as three,” John Ritchie, director of TFP Student Action, said in an interview, according to LifeSite. Indeed, LGBT activists have said they’re determined to indoctrinate children to accept the movement’s agenda.